Initially, all optional features are de-selected. The reason for this is to help you getting started easily. Once you have become acquainted with the mailing list software, you will see the use for some of the features. Allows you to save email body texts and use them again later. Use this if you want information contained in the mailing list table to appear in the body of emails. The simplest way to use this is in the greeting line, e.g. Dear [Fullname]. However if you use linked tables, you can pick up data from any field in that table, depending on what is useful in the email. If you select it, a combo box and a button appear at the bottom of the email text area with which you can select and drop fields from the mailing list on the body text. By default, emails are sent individually to each person in the mailing list with just 1 'To' email address for each email. When you select this option, a groupbox appears below the Email buttons which gives you the ability to send just 1 email with the list in the CC or BCC field of the email. 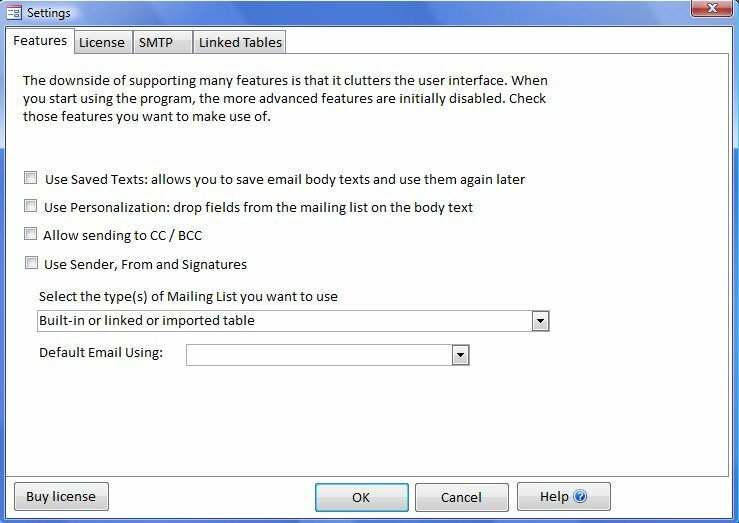 Set here which software will be set initially for sending the emails: MS Office Outlook or SMTP. Note that you can change the setting for a specific mailing list at any time.